December 20, 2018 – Toronto, Ontario: Royal Road Minerals Limited (TSXV:RYR) (“Royal Road” or the “Company”) is pleased to announce that it has received permission from the Ministry of Environment and Natural Resources in Nicaragua to complete two 1000 meter deep drill holes to test the porphyry copper and gold potential of its Los Andes project in Boaco Department of western Nicaragua. The permission is a Modification of the Company’s current Environmental Permit and provides specifically for the drilling of two diamond drill holes of no deeper than 1000m vertical depth from two drilling locations at the Company’s Carrao prospect area (Figure 1). The permission is provided for a period of 18-months commencing from the 18th of December 2018. The Los Andes Copper Gold project forms part of the Company's 50-50 Strategic-Alliance agreement (see press release; September 6, 2017) with Mineros Nicaragua (a subsidiary of Colombia’s Grupo Mineros S.A. MINEROS:CB). The project is characterized by a 7 kilometer long, strongly altered caldera-controlled “lithocap” which hosts anomalous copper, gold and pathfinder elements in rock-chip geochemical samples. Previous exploration (Caza Gold - acquired by Royal Road, see press release; March 15, 2017) was focused principally on testing the gold-potential of the project. Exploratory drilling campaigns conducted in 2014 and 2015 targeted silicified lithocaps and intersected strong alteration and anomalous copper and gold. 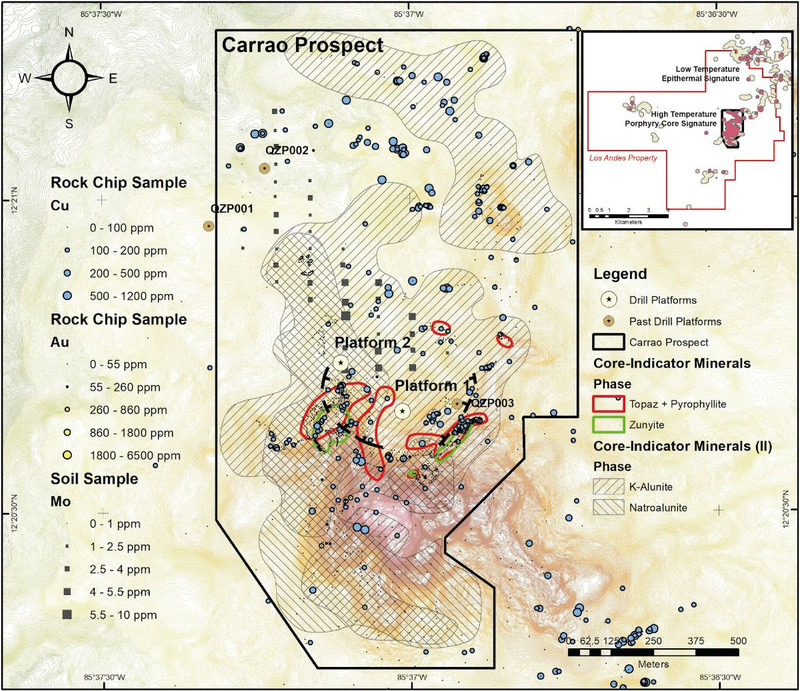 In 2015, an airborne geophysical survey was conducted over the area and highlighted a well-defined magnetic anomaly at the southern limit of the caldera structure, now known as the Carrao prospect area. Three drill holes were drilled in the area. All drill holes intersected anomalous copper mineralization with one drill hole (QZP-003), intersecting some 150 meters of massive pyrite, of a style interpreted to be consistent with the upper parts (pyrite-shell) of an underlying porphyry copper-gold system. Recent modelling and re-interpretation of the geochemical data collected from over 1500 rock samples, together with new soil geochemical analyses and short-wave Infrared (SWIR) satellite imagery, have highlighted an area of “porphyry core-indicator” and “porphyry core-specific” minerals and metals supporting the interpretation of an underlying porphyry copper-gold body. The geochemical and geophysical anomalies indicate that any potentially economic mineralization would be located at a depth in excess of 200 meters below the surface. The Royal Road exploration team has carefully positioned two scout drill holes to test the underlying porphyry copper-gold target (see Figure 1).